Today Australia's ABC announced another scientific paper in PNAS (open access). The paper is by Ben Santer et al and focuses on human influence on the structure of the atmosphere. It complements research in other areas and, as stated in the abstract, provide(s) clear evidence for a discernible human influence on the thermal structure of the atmosphere. In the last few days Anthony Watts has been making preposterous claims like the climate only warmed half as much as thought over the past 50 years (it hasn't). He even had a post as a "sticky" with an update claiming that "the IPCC edifice is crumbling". Because this first lot of IPCC reports (from Working Group 1) won't be out till the end of September this year, I can't comment on what it contains. But I am watching how the science deniers are cavorting around in advance of its release, trying to frame their own message. They aren't doing a very good job because they keep shifting their framing. A few hours ago Anthony Watts said he got a copy of the leaked draft dated 7 June 2013. This is the same draft that lots of mainstream media outlets got about a month ago so Anthony's probably feeling a bit left out. Now he's got the leaked draft in his hot sticky hands, he's decided he'd better "unsticky" his previous article and change his tune. I guess he feels he can no longer get away with the sort of silliness he's been bombarding his readers with over the past couple of weeks. Instead, Anthony has roped in perennially puzzled Bob Tisdale (archived here). Bob tells readers what they are supposed to see in a figure from the leaked draft. 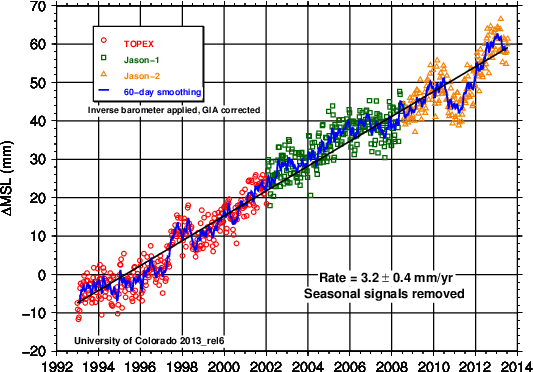 The figure in question shows up very well the rapid warming of the past few decades. Bob is basically telling his readers not to look at what is in the chart - he wants them to imagine what is not yet in the chart. He wants them to imagine a future. Bob is telling his readers to imagine that for the next 30 or 60 years there will be no further rise in the global surface temperature. Why he wants his readers to "see" this is fairly obvious to anyone who has come across Tisdale or WUWT in their travels. They don't want anyone to take any action to mitigate global warming. I know, I know, that's not a reason. One has to ask why they want us to keep heating up the world. It seems each person has their own particular reason. In Anthony Watts' case he's said it's because he doesn't like paying tax. In Bob Tisdale's case he's got a lot invested in his "theory" of magical leaping ENSOs and I guess he wants to give his fairies and leprauchauns a rest for a few decades. He realises he can only call on magic to explain the rise in surface temperature for so long before more of his readers will wake up to his claims of "warming by magic". Anthony has also been touting the "Not the IPCC" report (the NIPCC report). This report is written by "skeptics" not by climate scientists, so the duffers at WUWT who reject science get a consolation prize. I think the idea is that deniers get their own reward so they don't feel too jealous when the rest of the world is awarded the main prize - the real IPCC report. You can read his latest promotion archived here. It's not much of a consolation prize. Even Anthony admits that, referring to it as a "second" opinion. It's claimed to be written by only 40 fake skeptics, although most is probably written by only one or two people. Anthony announces it (again) with the weak headline: Major New Report on Tuesday: Climate Science Says Global Warming Is Not a Crisis. Not a very good headline, you'll admit. It's a bit like saying - "we operated and can announce that the patient isn't dead (yet)". Another thing the Not the IPCC report has against it is that it's a creature of the Heartland Institute. That's the crowd that argued mass murderers accept the science therefore the science is wrong. Yeah - I know. They are really, really nutty. And yet another thing the Not the IPCC report has against it is that it's associated with names like Fred Singer, Craig Idso, Willie Soon and Bob Carter. I don't know if Ian "iron sun" Plimer is involved. “NIPCC’s Climate Change Reconsidered II report is full of factual evidence that today’s climate continues to jog along well within the bounds of previous natural variation. A report by a team of international scientists concludes there now is no doubt climatic changes are due to humans rather than any other natural factors. As any informed climate watcher knows, these are all straightforward lies. Notice too how he couches a couple of his lies in terms he thinks he can get away with (eg ice is melting but not at an "enhanced rate". I don't know what Bob means by that it's not true in a global sense.) The fact that Bob Carter feels compelled to tell lies is a stark reminder of how far some people will go in order to hasten the destruction of civilisation. Again, it's a mystery why any human being would want to see the sixth mass extinction happen more quickly than it is already. Or why they don't want to limit dangerous global warming. I guess they have their own reasons. Their reasons might even be unrelated to global warming. It could be that some of them like being seen as a "big fish" even if it means flailing about and gasping for breath in a tiny and shrinking pond. 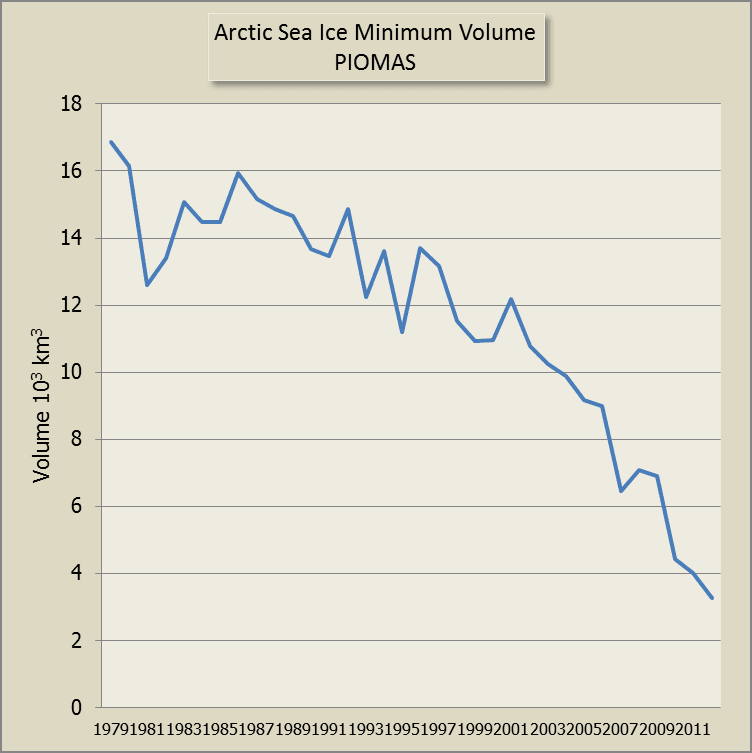 This chart shows the minimum volume of Arctic sea ice as modeled by PIOMAS. It only goes to 2012 because the minima for this year isn't in yet. 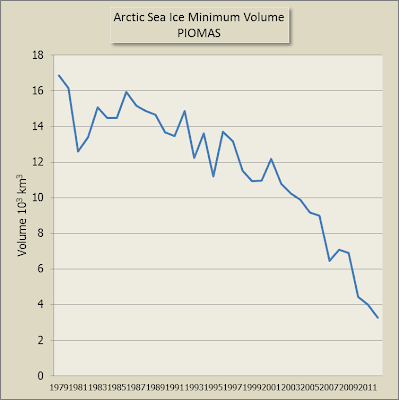 The current minima for sea ice extent is likely to be around that of 2010 but I don't know what will be this year's minima for sea ice volume. 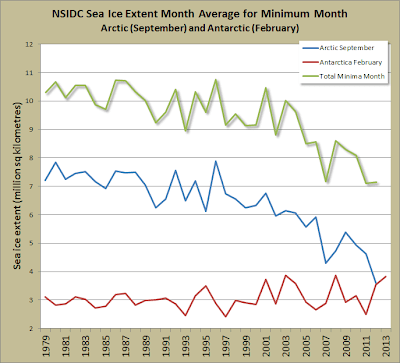 This one shows the annual minima for the Arctic and the Antarctic sea ice plotted on the same chart. The time is different because they reach their minima at different times of the year. It doesn't show this year's data which is not in yet. 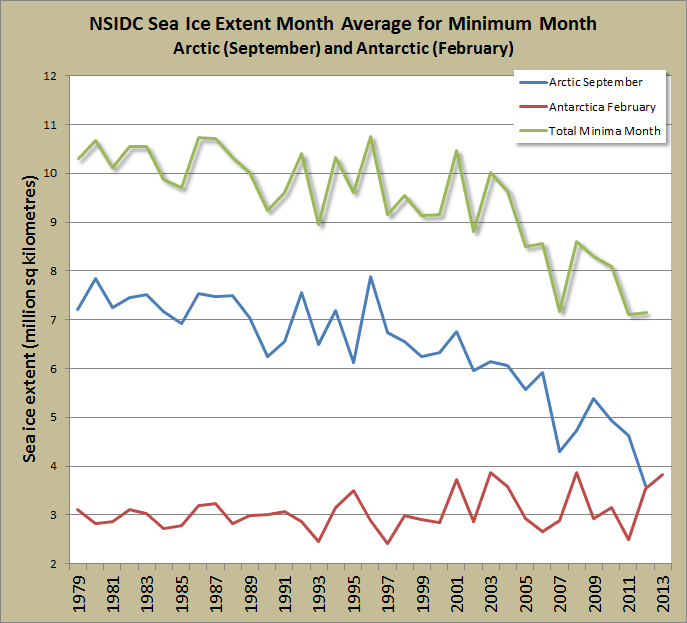 This year, Antarctic sea ice was higher than ever recorded, while in the Arctic, the sea ice remained very low but not as low as last year's record or that of 2007. It will probably fall between that of 2009 and 2010. I don't have charts of land ice to hand, but it's known that many more glaciers are receding than advancing and that the ice sheets in Greenland and western Antarctica and the Antarctic peninsula are melting. This chart from Munich Re shows the increase in extreme weather events around the world. (Click to enlarge.) About the best that fake skeptics come up with against this evidence is "I don't believe it" - the logical fallacy of personal incredulity. 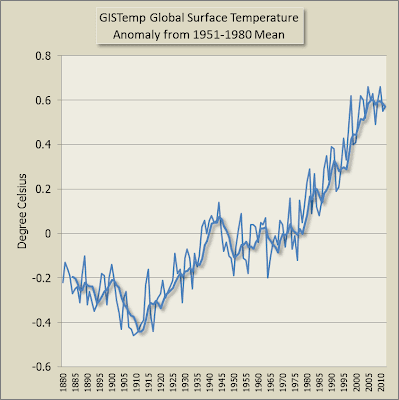 Bob Carter no longer denies that the world is getting hotter. He's shifted to arguing that is won't be dangerous. The evidence is otherwise. Heat waves are dangerous and have killed tens of thousands in Europe and Russia already this past decade. As they get hotter, they more dangerous. Droughts pose a danger to people's livelihood, their ability to access potable water (or any water in some cases) and limits the amount of global food production. Flash floods kill, wash away topsoil and destroy homes and buildings. Wildfire kills and will get more dangerous in parts of the world that dry out and heat up. Rising seas will mean that entire towns and cities will need to be relocated. They also kill when storms hit and the sea water surges through communities. When there is extreme heat and extreme humidity people will die. They can't survive it. Mammals have a physiological limit in regard to wet bulb temperature. That's not happened yet in any part of the world that I know of but it is a real danger. As oceans get more acidic there will be real impacts on the livelihood of fishers with a flow on effect to food supplies. As more species become extinct because they cannot adapt to the rapid change in climate, the entire ecosystem will be threatened. Most of the comments to the Not the IPCC article are about children suffering a fever. I think they welcomed the distraction of Anthony's quoting Prince Charles of England so they didn't have to face the reality that even the Not the IPCC report can deny - the world is getting warmer. By the way, Anthony disagrees with Prince Charles and seems to be arguing that if a child has a fever, the doctor should wait for endless tests before taking any action, even if it means the death of the child. Among this and other silliness, dbstealey, not satisfied with denying the greenhouse effect, is now denying the risks posed by passive smoking. You can read that article and the comments archived here. You can read an archived copy of Bob Tisdale's article and the comments here. They are mostly pretty dumb too. Many of them are of the "I don't believe it" type. Face it. We are in a marketing war. Scientists generally do not make good salesmen. It is an entirely different mindset. Charlatans make good salesmen, because they can infuse belief into their own self interest. They want what ? 60 More years to build their hypothesis ? Your time is up, SS CAGW, please return to port. So they have pushed doomsday out 30 – 60 more years. What a bunch of unscientific nonsense. Cherry-picking the future, based on their past batting average of 0.000. 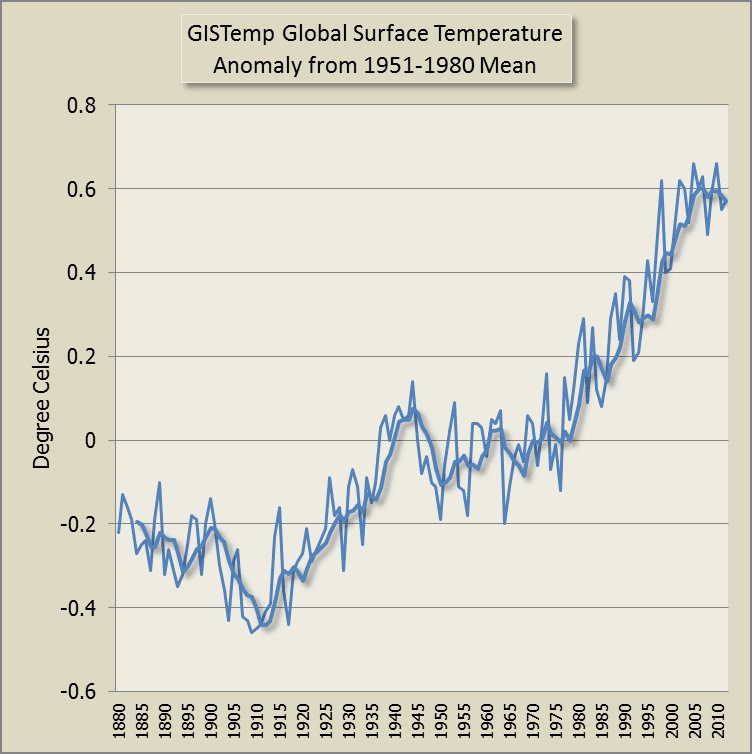 It is more likely that global temperatures will decline over the next six decades. If so, where do taxpayers go for a refund? Amazing how much colder the 1930′s and 40′s have gotten over the last couple of decades. The "standard" of WUWT continues to decline at a rapid pace. I reckon the trend in quality of WUWT and its readership is the inverse of global warming, which would make sense. "Not the nine o'clock news" was comedy. "Not the IPCC" is tragedy. I think we have progress. Yes, he used to say he's "agnostic" on global warming so he is making progress, but oh so slowly. Then again, he's been known to say in the same article that the world is warming, cooling and staying the same temperature. He's probably lost a lot of his faculties. Bob's an ideological denier (on Heartland Inst payroll). Maybe every now and there's a little bit remaining of the scientist that was once in him and it gives him a bit of a poke.